Tomorrow is the first of my Christmas nights out and I'm starting to panic that I don't have enough glitz and glam to get me through to the 1st of January. This time of year is hectic but it's a brilliant chance to get all dressed up. I love anything sparkly but a little black dress is also a big favourite. Depending on the event I vary between bodycon dresses and shift or skater dresses - there's no point in wearing a tight fitting dress if there's a big plate of turkey and all the trimmings involved. 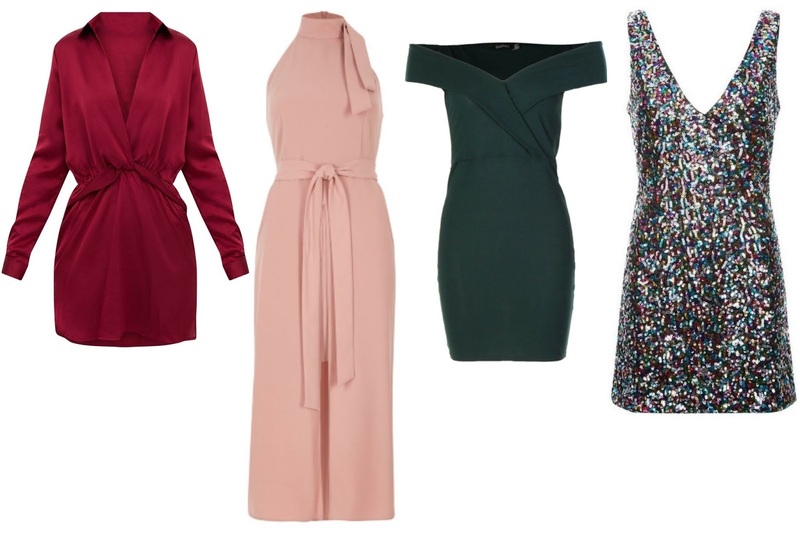 In case you're a bit like me and in need of a few last minute Christmas party outfits I've gathered together some of the best from the high street. The Metallic Wrap Maxi Dress is from Boohoo and an absolutely gorgeous one. The wrap style is quite a flattering shape and if your legs aren't your favourite part the maxi style can give you a little bit of a confidence boost. The metallic colour and material adds a bit of sparkle without being too over the top. 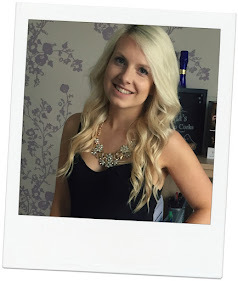 The High Neck Lace Dress is from New Look and even better has 50% off just now. I would definitely wear this for a girls night out, the style is quite sophisticated but suits a night of dancing and cocktails rather than food. The Black Sleeve Sequin Dress is potentially my favourite. It's from AX Paris who've got 40% off with the code PARTYON. I love the sequins and they're the style that won't cut you to shreds. This is a good dress if your arms aren't your favourite feature but I find long sleeve dresses are a winner for stormy weather like today. Lastly, and with the most sparkle is the Dorothy Perkins Mermaid Sequin Shift Dress. I would love to wear this to my works night out, it's a bit of statement dress but you could still wear a pair of tights if it's snowing or just if you're feeling old. 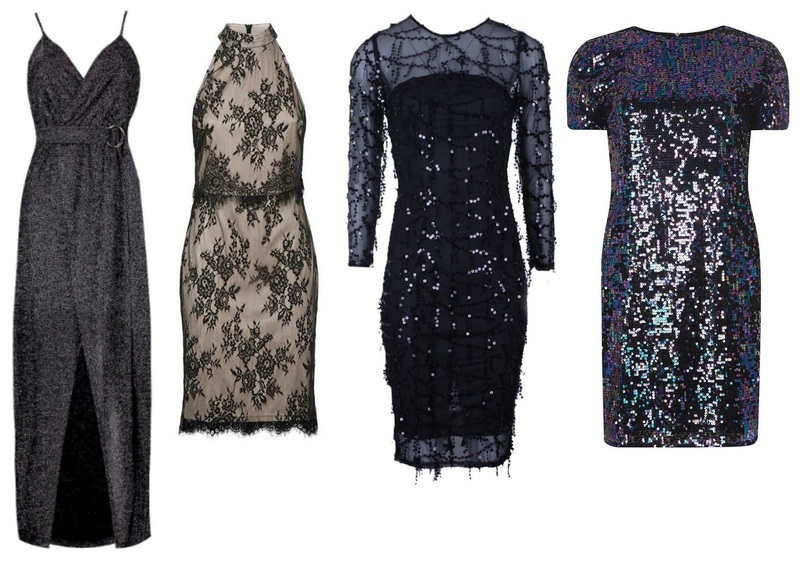 The last four dresses embraced the Little Black Dress vibe and all things twinkly. The next four are a bit more adventurous with their colour palette. The Burgundy Silky Shirt Dress from Pretty Little Thing is so sophisticated and glam. I love this colour for winter and Christmas too. The River Island Pink High Neck Midi Dress is a bit different for winter but a really stunning shape and fit. I think I'd like to wear something like this closer to New Year. Green is another must colour for Christmas and the Boohoo Green Off the Shoulder Dress is a total bargain at only £15. Bardot styles are one of the most flattering fits of 2017, in my opinion. I could not resist including the V Neck Multi Coloured Sequin Dress from New Look, if you can't wear a full on sequin dress at Christmas time, when can you? It's so glitz and glam, perfect for party season!